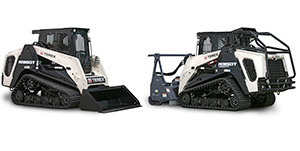 Terex expanded its compact track loader lineup with the addition of the R350T and R350T Forestry models. Both compact track loaders feature a 120-hp, turbocharged Tier 4 final Cummins QSF3.8 diesel engine. These models feature high-flow auxiliary hydraulics, 360 foot-pounds of peak engine torque, a high-capacity cooling system and a two-speed hydrostatic drive system that allows travel speeds up to 10 mph. The R350T loader has an operating weight of 11,265 pounds, a tipping load of 10,100 pounds, a 3,535-pound rated operating capacity and a lift height of 125 inches. The R350T Forestry unit has an operating weight of 12,255 pounds, a tipping load of 10,700 pounds—with a 3,745-pound operating capacity at 35 percent tipping load capacity—and a lift height of 125 inches. Engineered with a 6-foot profile, 15-inch ground clearance and low ground pressure—4.4 psi on the R350T unit and 4.3 psi on the R350T Forestry model—these Terex loaders work well in limited access areas, as well as on soft or sensitive surfaces, with minimal damage or impact, Terex said. The R350T and R350T Forestry models use an all-rubber track, rather than a rigid track technology with steel embedded tracks mounted on an existing skid-steer chassis. By utilizing composite materials rather than a steel skeleton, Terex tracks do not corrode or rust, the company said. Additionally, the Terex R350T and R350T Forestry loaders are designed with front-mounted quick-connect hydraulic fittings and an electronic connector for control of attachments. These models are also equipped with pilot-operated joystick controls. On models equipped with heat or AC, a pressurized and sealed enclosed cab comes standard.